Long gone are the days when all job applications were both accepted and rejected by an official letter on headed paper. Letters have long since given way to emails and now emails are giving way to emojis. At least some level of formality should be retained when it comes to the giving or taking of a job, we are after all talking about someone’s livelihood. However, this was not the case when it came 18-year-old Megan Dixon, who applied for a waitressing job at Miller and Carter in Leicester. Dixon was told by her potential employer that she would learn via email if her application had been successful. When Dixon replied asking why, she received a second text. ‘Just not engaging,’ it read. 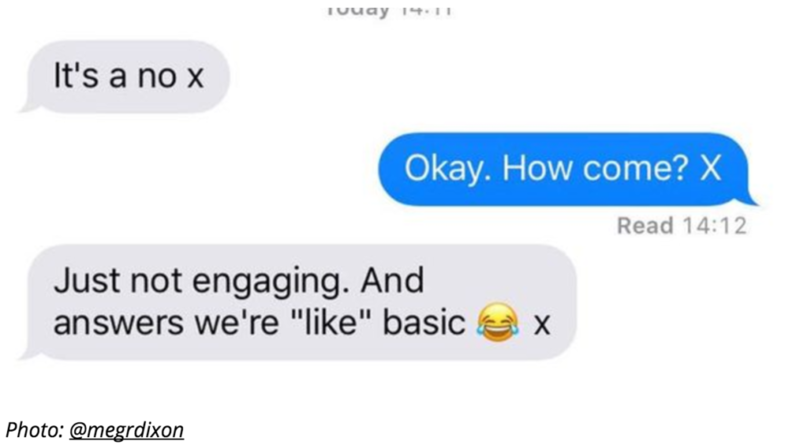 ‘And answers were ‘like’ basic’. The the text was followed by a highly sarcastic laughing face emoji. This unprofessional way of handling the hiring process, is to say the least, unusual, but a more casual approach is becoming more commonplace. A spokesman for Miller and Carter has since announced that the incident is under investigation and claimed that the text were mistakenly sent. ‘It was never our intention to be disrespectful or upset her in any way,’ the spokesman said.